I work in the high desert of southern Utah all winter long, going backpacking in the wilderness for stretches of 8 days at a time. I experience freezing temperatures, rain, hail, snow, and clouds that last all day, often in the course of a single work week. I bought the Feathered Friends Women’s Plover -25 F sleeping bag because last winter my set-up didn’t cut it (Z-Packs 10 F bag + a sleeping bag liner + every single layer of clothing I had). There’s nothing worse than working all day and staying up all night because I’m cold. Hence, my purchase of an expedition-grade down sleeping bag. My sleeping bag kept me warm during a snowy Christmas shift. I have been using this sleeping bag in the desert for at least 16 days a month since October (currently it is January). I haven’t been testing the bag to it’s full capacity, as the temperature has only dropped down to the high teens while I’ve been out. The rest of my set up I use it with is a tarp for shelter (or sleeping without a shelter), a foam sleeping pad, and an inflatable Nemo sleeping pad (not insulated). What are the best aspects of the Feathered Friends Plover -25 sleeping bag? Warmth. Perhaps the most important feature of the Plover. It is warm. I’m a cold sleeper generally, and I have yet to feel cold in this sleeping bag. I sleep while wearing base layers, and I haven’t had to put additional clothing on yet. The cinch above my shoulders traps all the warm air in. If temperatures are in the mid-thirties or higher I usually have to unzip the bag a little so I’m not hot. It is also so lofty it looks like there’s a person in it. Winter in the Utah desert. Weather resistance. The fabric is made of Pertex-Shield, which means that it is water and wind resistant. If water droplets get on the sleeping bag, they don’t soak up into the down. It’s only when the sleeping bag is continually exposed to wet conditions with poor protection does it start to soak up water. In December, there were three days straight of rain, snow, and clouds. I slept under a tarp (I didn’t have as much protection as a tent would offer), and the sun did not come out so there were no opportunities to dry the bag out. While it got a little damp in spots, I was still warm and cozy at night. I feel protected from the wind while sleeping in the Plover. No more shivers when a strong gust comes along. Roominess. I’m 5’7″ and have plenty of room to wiggle around in this bag. I certainly have the extra space to add more layers of clothes to my body without being squeezed in if I needed to. In cold weather, I like to keep the pants and jackets I’m going to wear in the morning in my sleeping bag with me. That way they are nice and warm, and I don’t have to slide into chilly clothes. You guessed it, there’s room for the entire contents of my clothes bag to be zipped up in the Plover with me. When I’m reading at night, there is space for me to hold my book away from my face inside of the sleeping bag, so I don’t get numb fingers. Weight and compatibility. As an ultra-light backpacker, the 3 lbs. 11 oz. weight of the Plover made me cringe at first. I eventually had to accept that my base weight for winter backpacking will inevitably be much heavier than my summertime base weight. For a bag that keeps me toasty in freezing temperatures, less than 4 pounds is pretty good. The Plover compacts well enough that it fits horizontally in the bottom of my Granite Gear Nimbus Trace. The trick I discovered is to lay on top of the sleeping bag to get all the air out before packing it up. Keeping toasty on break time. My feet get colder than the average person’s feet. When temperatures drop below 20 F, I have to work extra hard to keep my toes warm, even in the Plover. Feathered Friends put ample amounts of down in the foot box of this sleeping bag, but I could still use a bit more. If it is a particularly cold night, I usually need to keep a hot water bottle at my feet or put hot hands in my socks. 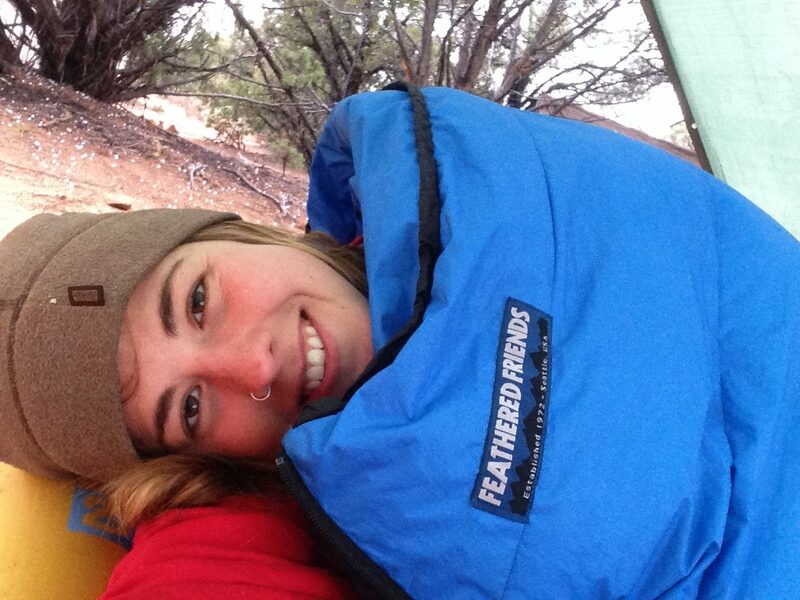 Overall, I would highly recommend the Feathered Friends Women’s Plover -25 for any winter backpacking excursions.